Turn left out of Church Street (which becomes College Road), into Bresler Street where the massive white sign board says “Obesa Wholesale Nursery”. In the heart of Graaff Reinet lies a totally unexpected surprise in the form of a nursery, which might just as well be called a garden as a wander around will soon divulge. 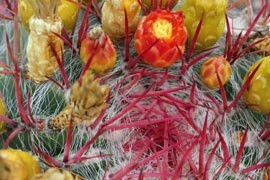 Even the pavement where you park the car gives more than a hint of the display to come but it is not until you are within the nursery that the huge maze of towering cacti and succulents becomes truly apparent. Obesa nursery has been here since 1970, started as something of a hobby, and stocks well over 7 000 species of plants. At the heart of the nursery is a labyrinth that follows the seven chakra colours from the outside in. The nursery also raises its own 35 000 odd plants every year, and stocks well over 2 million. What is truly overwhelming is the size of the cacti – it must be the heat in Graaff Reinet – some stand five to ten metres high. And there are so many cacti many of us will never have even seen. The nursery is one of the biggest privately-owned nurseries in the world today. Interestingly, things on this little 110x160 metre nursery must have soon got out of hand as the 'new' nursery lies out of town in Graff-Reinet. 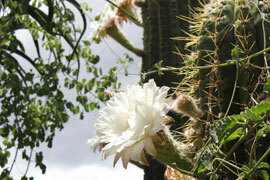 There you will encounter row upon row of cacti growing for market, against the backdrop of mountains – a beautiful sight.